Hello There, today I am sharing a simple Waffle Flower Crafts card project. To begin my card I cut the panels for my card first. The grey cardstock I adhere on the card base. I then distress the white cardstock panel with Distress Ink in Peacock Feather and a hint of Wild Honey. 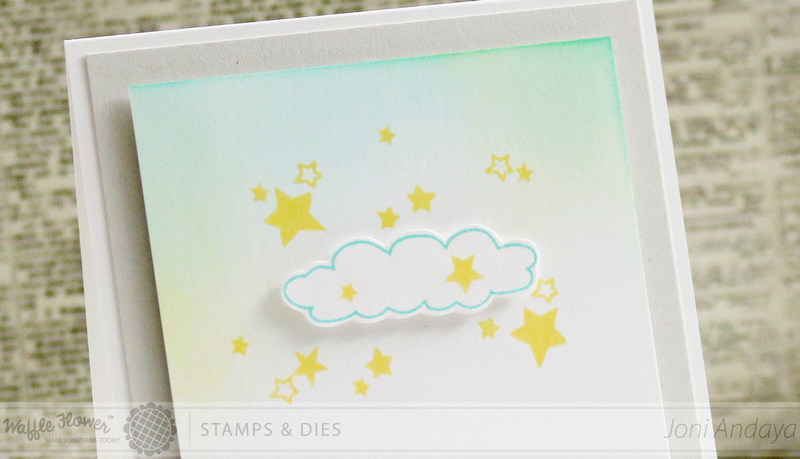 I then stamped the cloud image, fussy cut, adhere with foam dots, and stamped some stars from Riverside Stamp Set. Next, I stamped the bunny from the Riverside Stamp set, colored it with Copics, and fussy cut. I then added the grass image from the Rock My World Stamp Set. To finish off the card I then added the sentiment from the Starry Night. Here's the full image of the card. To see all the Waffle Flower Crafts products please click HERE. You can also check out Waffle Flower Crafts Blog for more inspirations. Its Awesome !! The lightly inked pane look fab n the cute image too ! So beautiful!!! Love love love the bunny!!!!!!!! So soft and cute. I love the dimension and the pretty background. 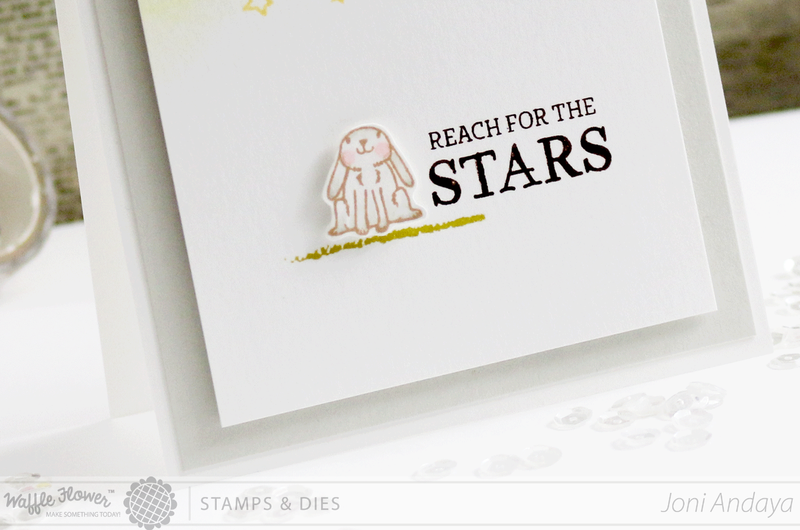 Beautiful card.I love what you did with the distress inks.Lovely soft shading and feel and that bunny is super cute. Oh that little bunny steals my heart, sweet card Joni!! This is just the cutest, sweetest card ever, Joni! Lovely!!! That little bunny is adorable! What an adorable card Joni! soooooooooo sweet! love the cloud and bunny!